After you install the Module for ASP.NET Testing on a computer running WAPT or WAPT Pro Workplace, you will be able to test ASP.NET sites containing, in particular, ASP.NET AJAX UpdatePanel Controls. It is just the case of ASP.NET AJAX UpdatePanel Controls usage. In both cases, the Module for ASP.NET Testing will extract __VIEWSTATE and __EVENTVALIDATION parameters from responses and correctly parameterize them. This is done automatically by the module, so you will not need to do any additional work and parameterize ASP requests manually. 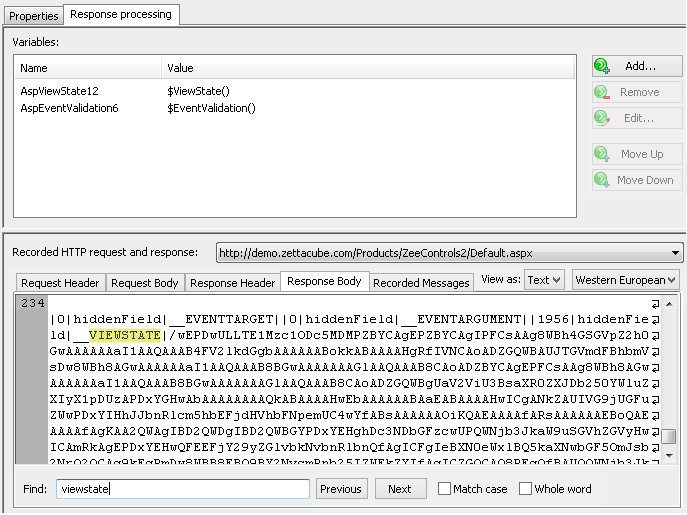 The module detects from which response the current __VIEWSTATE (__EVENTVALIDATION) was extracted, and substitutes the necessary variable to the corresponding request which uses that __VIEWSTATE (__EVENTVALIDATION). So, the Module for ASP.NET Testing automatically finds __VIEWSTATE and __EVENTVALIDATION parameters in server responses and parameterizes them, so that correct __VIEWSTATEs (__EVENTVALIDATIONs) are extracted from the necessary responses and transferred to the corresponding requests. If this module is not installed and you record ASP requests, then at the end of recording process you may receive a warning message. It notifies you that some of requests contain ASP, so they will not be parameterized because the module is not installed. Note that the Module for ASP.NET Testing is optional. It facilitates the design of your profiles and reduces the amount of manual work required to test an ASP.NET site. If you are not sure about the necessity to use it in your case, you can try the following steps. After recording a virtual user profile, verify it using the "Verify Test" button on the toolbar. Take a look at the created logs. You can find them in the "Logs" folder in the left view. If you see errors occurred during the verification, especially 500 (internal server error), 501 or similar ones, it means that profiles have been parameterized incorrectly. In this case you can either install the Module for ASP.NET Testing, or try to parameterize your profiles manually using regular WAPT functions available without the module. If you choose to install the Module for ASP.NET Testing, please re-record the profile and try to verify it again. If you still receive errors, please send your profile to our Technical Support team for a review: support@loadtestingtool.com. Note. In the unregistered version of Module for ASP.NET Testing, the maximum number of virtual users for tests containing ASP requests is limited to 20. This limitation is removed when you register the product.